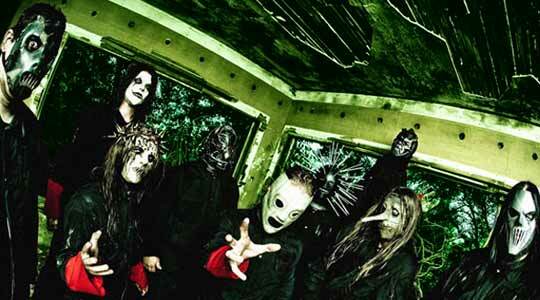 Slipknot Biography, Discography, Music News on 100 XR - The Net's #1 Rock Station!!! 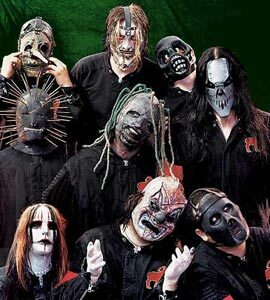 This Alternative-Metal, Rap-Metal outfit was formed in 1995 in Des Moines, Iowa USA and consisted of nine members: lead singer Corey Taylor, guitarists Mick Thomson and Jim Root, bassist Paul Gray, drummer Joey Jordison, percussionists Shawn 'Clown' Crahan and Chris Fehn, sampler Craig '133' Jones and DJ Sid Wilson. By the fall of 1996 the crew self-released their first full-length disc that landed them a deal with Roadrunner Records. In 1999 Slipknot issued their self-titled album which cracked The Billboard Top 200 chart reaching the #51 position; despite only one single, "Wait And Bleed", barely sneaked into the top 40 of The Mainstream Rock chart, their major label debut-disc went platinum on the force of their energetic live shows. All the band members wear on stage horror masks, it contributed to build a strong buzz around the group. Released in August 2001, "Iowa" quickly grew to the #3 spot in the United States, #1 in Canada and even entered the top 10 in several European Albums charts. The first album single slated for U.S. national airplay was "Left Behind", it climbed into the top 30 of The Mainstream Rock chart. During the following years various members of the group began working on outside projects; frontman Corey Taylor released the smash single "Bother" for the soundtrack of the movie "Spiderman"; the track subsequently became part of the Stone Sour's first eponymous full-length CD. Slipknot returned in May 2004 with their fourth album, "Vol. 3: (The Subliminal Verses)"; the first single, "Duality", crashed into the top 10 on both Mainstream and Modern Rock Tracks, the follow-up single, "Vermilion", made the Billboard's Active and Alternative Rock top 20 and "Before I Forget" fell one spot short of entering the top 10 of The Mainstream Rock chart earning the Des Moines rockers a Grammy Award for Best Metal Performance. The album hit #2 on both the U.S. Billboard 200 and the Top Canadian Albums charts and also made a strong impression on the European charts with a #5 peak position in Britain. The final American single, "The Nameless", reached #25 on the Active Rock chart. After a four year recording gap, with over 5 million albums sold in the U.S. Slipknot resurfaced in August 2008 with their most powerful statement yet, "All Hope Is Gone", their first #1 album on The Billboard 200 list; the record was preceded by the free downloadable single, the album's title-cut and the official radio single "Psychosocial" which peaked at #7 on The Hot Mainstream Rock and at #20 on The Hot Modern Rock charts. This was followed by two more Active Rock top 3 hits: "Dead Memories" and "Snuff" as well as a top 20 entrant, "Sulfur".